I PETER 5:7 NASB-Casting all your anxiety on Him, because He cares for you. ICB: Give all your worries to him, because he cares for you. Young’s Literal: all your care having cast upon Him, because He careth for you. They did not throw pieces of their coat on the colt but the “all” of the coat. That is, take it to the Lord in prayer, and leave it there! Don’t pick it up again. Similarly believers are to cast “all” (the whole in its entirety) of their care upon Him. The emphasis is not on casting each individual anxiety, but on casting the whole of one’s life upon the Lord. Stated another way, Peter does not say to be “casting the big burdens and keeping the little ones!” We all need to come to the place where we realize that God is all sufficient for all problems that may come into our lives. No heartache, difficulty or problem is too difficult for the plan of God. No sin is too great for the plan of God. Beloved, our heavenly Father is willing and able to carry our heaviest (and lightest) burdens but before we can experience God’s sufficiency, we need to acknowledge our insufficiency to live the Christian life. Is there some anxiety you carrying just now, dear child of God? What is your heartache? What grief do you bear today? What disappointment? What hurt feeling? Whatever the burden, go to His throne of grace to receive mercy and find grace by casting it upon Him, for He does not want you to carry that burden. Spurgeon comments: Thy burden, or what thy God lays upon thee, lay thou it upon the Lord. His wisdom casts it on thee, it is thy wisdom to cast it on Him. He cast thy lot for thee, cast thy lot on Him. He gives thee thy portion of suffering, accept it with cheerful resignation, and then take it back to Him by thine assured confidence. He shall sustain thee. Thy bread shall be given thee, thy waters shall be sure. Abundant nourishment shall fit thee to bear all thy labors and trials. As thy days so shall thy strength be. Anxiety😦3308) (merimna from merizo = to divide or draw different directions – which is exactly what anxiety does to most of us!) refers to a care (the sole way it is translated in the KJV) or concern and so to care for someone or something. It is often used in a negative sense and thus is translated as “worry“. From the origin, one can see that merimna describes the state of “being pulled apart.” Thus when circumstances are difficult, it is easy to let oneself be dominated by anxiety and worry. God does not make His children carefree (Ed note: freedom from anxiety producing situations) in order that they be careless. What the pagan Greeks experienced as anxious concern over a tomorrow they could not control, the believer who knows God as a loving Father can experience in calm confidence. Released from fears about tomorrow, we can concentrate on doing God’s will today, as obedient subjects of a kingdom over which the Almighty rules. The Gospels recognize the tendency of legitimate human concerns to lead to a loss of perspective; we can forget God and adopt a pagan materialism that looks ahead anxiously and concentrates on running after the material things that seem to offer security. In order to avoid this tendency, believers must orient life to God and realize that life’s meaning is to be found in living as subjects who are responsive to their loving, wise, and powerful King. Both anxiety and worry spring from natural and legitimate concerns that are part of life in this world. But legitimate concerns are handled wrongly when they do one or more of the following: (1) become dominating concerns in our life and lead to fear, (2) destroy our perspective on life and cause us to forget that God exists and cares, or (3) move us to drift into an attitude of constant worry and concern over a future that we cannot control. Jesus deals with anxiety by calling us to an awareness of God. God does exist, and he cares. He is aware of our needs and is committed to meet our needs. Remaining aware of God frees us from the tyranny of things. It enables us to focus our lives on our relationship with God and go on living a righteous and productive life. merimna (3308) is probably connected with merizo, (3307) “to draw in different directions, distract,” hence signifies “that which causes this [that is, this effect of being drawn in different directions], a care, especially an anxious care”. To worry is in essence to have a “divided mind” (See RBC booklet What Can I Do With My Worry?). Strong’s Lexicon also states that merimnais from “merizo, (3307) through the idea of distraction.” So clearly that which worries or causes anxiety is that which distracts us and tends to draw us in different directions (compare our common expression “I feel like everything is falling apart”). Its Middle English descendant, worien, kept this sense and developed the new sense “to grasp by the throat with the teeth and lacerate” or “to kill or injure by biting and shaking.” This is the way wolves or dogs might attack sheep, for example. 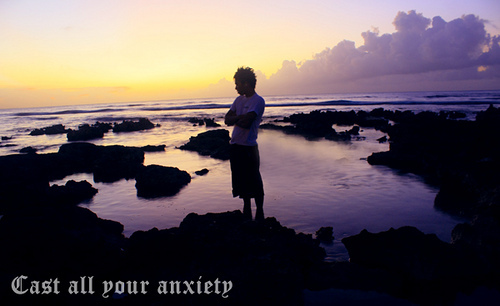 Besides anxiety (be anxious) another word that is synonymous with worry is the verb fret (derived from Old English word fretan meaning to devour or consume), which literally means to eat or gnaw into and figuratively pictures causing one to suffer emotional strain, be distressed, or feel vexation. Again the etymology or origin of the word fret so perfectly describes the detrimental, destructive effect of the emotional state of worry and anxiety. Are you worried about your tendency to worry? Let me encourage you to turn your attention to God, especially to an unhurried devotional study of His character revealed in His names or more specifically in His attributes (See “The Attributes of God“). You will be amazed at how the Spirit will renew our mind when we shift our focus off of the perplexity of the problems and onto the perfection of the Problem Solver, and once again appreciate that He is everywhere, knows everything, is all powerful, and is able and willing to carry our burdens (Ps 55:22, Heb 2:18–note). There is nothing Christ dislikes more than for His people to make show of Him and not to use Him. He loves to be worked. He is a great laborer. He always was for His Father, and now He loves to be a great laborer for His brethren. The more burdens you put on His shoulders, the better He will love you. Cast your burden on Him. An experienced physician decided to analyze the “worriers” who were his patients. He found that 40 percent of them were apprehensive over things that never happened. About 30 per-cent concerned themselves with past matters now beyond their control. Another 12 percent anxiously feared the loss of their health, although their only illness was in their imagination. And the rest worried about their families, friends, and neighbors, but in most cases he discovered no basis for their fears. A bassoon player once came to the great conductor Toscanini with furrowed brow and complained that his instrument would not sound the high E flat. Toscanini smiled and replied, “Don’t worry. There is no E flat in your music tonight.” The musician had been needlessly apprehensive. Many of our worries are like that — unfounded and unnecessary. Now “Faith” has given rest. — G.W. Satan seeks to crush our spirit by getting us to bear tomorrow’s burdens with only today’s grace! You don’t know the troubles I have! My friends, if you go to the Lord with your troubles, He will take them away. Would you not rather be with the Lord and get rid of your troubles, than be with your troubles and without God? Let trouble come if it will drive us nearer to God. It is a great thing to have a place of resort in the time of trouble. How people get on without the God of the Bible is a mystery to me. If I didn’t have such a refuge, a place to go and pour out my heart to God in such times, I don’t know what I would do. It seems as if I would go out of my mind. But to think, when the heart is burdened, we can go and pour it into His ear, and then have the answer come back, “I will be with him,” there is comfort in that! I thank God for the old Book. I thank God for this old promise. It is as sweet and fresh today as it has ever been. Thank God, none of those promises are out of date, or grown stale. They are as fresh and vigorous and young and sweet as ever. Take courage: if God doesn’t choose to remove an obstacle, He will help you plow around it! Even though you can’t control your circumstances, you can control your attitude. The perfect cure for worry is trust in God. There are two days in the week about which I never worry. Two carefree days kept sacredly free from fear and apprehension. One of these days is yesterday—and the other day I do not worry about is tomorrow. Anxiety is the interest paid on trouble before it is due. Or stated another way it is the interest paid by those who “borrow” trouble! Fretfulness springs from a determination to get my own way. Sweeting, G. Great Quotes & Illustrations. Anxiety is the natural result when our hopes are centered in anything short of God and his will for us. I am inwardly fashioned for faith, not for fear. Fear is not my native land; faith is. I am so made that worry and anxiety are sand in the machinery of life; faith is the oil. I live better by faith and confidence than by fear, doubt and anxiety. In anxiety and worry, my being is gasping for breath—these are not my native air. But in faith and confidence, I breathe freely—these are my native air. A John Hopkins University doctor says, “We do not know why it is that worriers die sooner than the non-worriers, but that is a fact.” But I, who am simple of mind, think I know; We are inwardly constructed in nerve and tissue, brain cell and soul, for faith and not for fear. God made us that way. To live by worry is to live against reality. When CIM missionary Arthur Matthews was trapped in Communist China, uncertain of life or death, he was summoned before authorities who were pressuring him to earn his freedom by agreeing to spy for the Communists. That morning he kissed his wife and little one goodbye, and left for the police station, not knowing if he would ever return. In his pocket, he put a copy of Daily Light. When Sara died, Havner remembered that Lazarus had died, too. “I will say of the Lord, ‘He is my refuge and my fortress; my God, in Him I will trust’” (Ps. 91:2). Stated another was, anxiety is a burden which faith casts off the man onto his God. My hearer, it is so with your trouble. Whether you worry or do not worry, it is the Lord who must care for you. …is the interest we pay on tomorrow’s troubles. …over tomorrow pulls shadows over today’s sunshine. …is like a rocking chair; it will give you something to do, but it won’t get you anywhere. …is a guest admitted which quickly turns to be master. “Not worried about it!” exclaimed his friend. “Fifty thousand dollars a year,” replied the first man. We scarcely know when life will worry us half to death. Consider Pastor A. J. Jones in South Africa. Wanting to sell a television set, he ran a classified ad in a Pretoria paper. As first printed, the ad said: The Rev. A. J. Jones has a color TV set for sale. Telephone 555–1313 after 7 P.M. and ask for Mrs. Donnelley who lives with him, cheap. The next day, the paper printed this correction: We regret any embarrassment caused to Rev. Jones by a typographical error in yesterday’s editions. It should have read, “The Rev. A. J. Jones has color TV set for sale, cheap. Telephone 555–1313 and ask for Mrs. Donnelley who lives with him after 7 P.M.
One day later: Please take notice that I, the Rev. Jones, have no TV set for sale. I have smashed it. I have not been carrying on with Mrs. Donnelley. She was until yesterday my housekeeper. (1) Giving us the courage to face our cares honestly and not run away (“Do not fear, for I am with you. Do not anxiously look about you, for I am your God. I will strengthen you, surely I will help you. Surely I will uphold you with My righteous right hand.” Is 41:10). (2) Giving us the wisdom to understand the situation (“…if any of you lacks wisdom, let him ask of God, Who gives to all men generously and without reproach, and it will be given to him. But let him ask in faith without any doubting, for the one who doubts is like the surf of the sea driven and tossed by the wind.” Ja 1:5-6). (3) Giving us the strength to do what we must do (“Not that I speak from want; for I have learned to be content in whatever circumstances I am. I know how to get along with humble means, and I also know how to live in prosperity; in any and every circumstance I have learned the secret of being filled and going hungry, both of having abundance and suffering need. I can do all things through Him who strengthens me.” (Philippians 4:11, 12, 13 – notes Phil 4:11-13). (4) Giving us the faith to trust Him to do the rest (“Commit your way to the LORD, trust also in Him, and He will do it.” Ps.37:5). “Anxiety” (Click Jehovah Shalom [and scroll down for “Seven Thieves that Can Steal Your Peace] or Phil 4:6, 7–Notes for additional discussion) is the Greek word merimna (from merizo which means to divide or draw in different directions and so to distract) which pictures that which causes one’s mind to be “split” or drawn in different directions which results in “anxiety”. And so we begin to think things like “Will this turn out to be a bad thing or a good thing?” In the past anxiety was explained as a “dividing care”, distracting the heart from the true object of life. It is the uneasiness and worry about the future which Peter exhorts us to cast upon El Shaddai, the Almighty, All Sufficient One. Allowing one’s mind to go “in different directions” at the same time, will result in a loss of focus and concentration and may leave you virtually “incapacitated”, not knowing which way to turn. Such a state also will distract one from our primary focus, which should be Christ Jesus our Lord. Webster says that anxiety is a painful or apprehensive uneasiness of mind usually over an impending or anticipated ill, a fearful concern or interest or an abnormal and overwhelming sense of apprehension and fear often marked by physiological signs (as sweating, tension, and increased pulse). Webster goes on to add that anxiety is characterized by doubt concerning the reality and nature of the threat or by self-doubt about one’s capacity to cope. Trust Him completely and doubtings will flee. Someone has well said anxiety and worry are both like a rocking chair—they will give you something to do, but they won’t get you anywhere. Anxiety is a burden that God never meant for us to bear. Most of what we are anxious about never comes to pass. And so in a sense worrying and anxiety is like paying interest on troubles that may never come due! But even when trouble knocks, God is there to show us a new course. When fear knocks at your door, let faith open it. We can avoid the folly of anxiety by trusting Him today for all our tomorrows. 1. Fret not–because God loves you (1Jn. 4:16). 2. Faint not–because God holds you (Ps 139:10). 3. Fear not–because God keeps you (Ps 121:5). Meditate on what Peter is saying…literally he writes that “it matters to Him concerning you”! Why cast them upon Him? Upon what basis do we do so? In this beautiful phrase, Peter states that it is simply because God cares for us. We must first understand God’s caring character before we can carry out carefree casting of our anxieties. Do you know Him this way? Do you really belief that the infinite, majestic, almighty God of the universe really cares for you in such a personal way? If you don’t believe this truth, then you will in fact have difficulty casting your cares upon Him. A good way to renew your mind regarding God’s character is to study God’s Name, A Strong Tower or The Attributes of God. Cares (melo) means to be interested in, to show watchful care and affection or to show concern for. The verb melo is in the present tense which indicates that God cares for us continually, so much so that one might say that God is our caretaker! Jesus showed them how much He cared for them with a beautiful declaration “Hush, be still.” Perhaps those are words you too need to hear today, beloved. And so we see that a stormy sea had been allowed by a sovereign God to teach the disciples a lesson in simple child-like faith. And the same God uses the variegated storms in our life to similar advantage. As a believer you have come to know Jesus as your “Sin-bearer” but have you also come to know Him as your “Burden-bearer”? A T Robertson says cast your cares upon Him because it “is a care to Him”! The psalmist says that “the eyes of the LORD are toward the righteous and His ears are open to their cry.” (Ps 34:15) Dearly beloved, if your heart is weighed down today, the Lord is ready to bear every burden you give Him. When anxiety walks in, strength runs out, but strength returns when we let God in. We must remember that God does not design the stressful situations in our life to break us but to make us. Ultimately, His desire is that we move from trusting in ourselves, our abilities or resources, to a lifestyle of resting in Him and His all sufficient resources. This is abiding in the Vine (John 15:5). Spurgeon comments: Blessed be the Lord. At the mention of the presence of God among men the singers utter an earnest acclamation suggested by reverential love, and return blessings to him who so plentifully blesses his people. Who daily loadeth us with benefits. Our version contains a great and precious truth, though probably not the doctrine intended here. God’s benefits are not few nor light, they are loads; neither are they intermittent, but they come “daily;” nor are they confined to one or two favourites, for all Israel can say, he loadeth us with benefits. If He Himself burdens us with sorrow, He gives strength sufficient to sustain it; and if others endeavour to oppress us, there is no cause for fear, for the Lord will come to the rescue of His people. Happy nation, to be subdued by a King whose yoke is easy, and who secures His people from all fear of foreign burdens which their foes might try to force upon them. Even the God of our salvation. A name most full of glory to Him, and consolation to us. No matter how strong the enemy, we shall be delivered out of his hands; for God Himself, as King, undertakes to save His people from all harm. What a glorious stanza this is! It is dark only because of its excessive light. A world of meaning is condensed into a few words. His yoke is easy, and His burden is light, therefore blessed be the Saviour’s name for evermore. All hail! thou thrice blessed Prince of Peace! All Thy saved ones adore Thee, and call thee blessed. Selah. Well may the strings need tuning, they have borne an unparalleled strain in this mighty song. Higher and yet higher, ye men of music, lift up the strain. Dance before the ark, ye maidens of Israel; bring forth the timbrel, and sing unto the Lord Who hath triumphed gloriously. But He cares for us. My soul, has not Jesus proved it? Did He not care for you when He embarked in the work of your salvation? Did He not care for you when you were dead in trespasses and in sins? (Ephesians 2:1– note) And when the Holy Spirit convinced you of sin, and broke your heart, and led you in holy contrition to the cross, did not Jesus manifest His care for you then by raising you up from His feet, enfolding you in His arms, and applying His atoning blood to your conscience, saying to your tempest-tossed spirit, ‘Peace, be still,’ and there was peace? The Lord cares for you still. He cares for your needs, for your trials, for your temptations, for your sorrows. Still more, He cares for your holy, happy walk–for the doubts and fears and tremblings which sometimes assail you–for the darkness which often enshrouds you–for the loneliness and solitude of the way by which He is leading you home to Himself. Only cast your care upon Him, whatever it may be, with a child’s simple, unquestioning, unhesitating faith, and be anxious only how you may most love, trust, and glorify Him. Make His service your delight, His honor your study, His truth your care, and sweet peace will spring up in your soul, shedding its soothing influence throughout your whole being. But, besides the blessedness we lose in giving way to care, we must remember that such behaviour sorely grieves and dishonours God. It grieves Him, as love must grieve when suspected of insincerity. And it also sorely dishonours Him. We judge a parent by the report given of him in the words and behaviour of his children. If they seem half-starved and miserable, or look wistfully to us for a dole of help, or complain bitterly of the hardships of their lot, we conclude–however wealthy he may be as to his income, or munificent as to his gifts–that he is hard and cruel: and we withdraw from him as far as possible. So, if the world judges of God by the looks and words of many of his professed children, is it wonderful that it is less attracted than repelled? Either there is no God, or He is powerless to help, or He does not really love, or He is careless of the needs of his children–such must be the reflections of many, as they look on the weary, careworn, anxious faces of God’s professed people, and remark in them the same long deeply-ploughed furrows as the years have made for themselves. Of course there must ever be the discipline and chastisement of life. Our Father deals with us as with sons: and what son is he whom the Father chasteneth not? And these strokes of his rod, these cups mingled by his hand, must be bitter to the flesh. But all this is very different from “care.” There may be pain–but no doubt of the Father’s love, no worry about the issues, no foreboding as to the long future, which to the eye of faith shines like the horizon-rim of the sea on which the sun is shining in its utmost splendour, while dark clouds brood overhead. Care, according to the Greek word, is that which divides and distracts the soul, which diverts us from present duty to weary calculations of how to meet conditions which may never arrive. Fret; worry; anxiety; the habit of anticipating evil; crossing bridges before we reach them; the permission of foreboding fears about the future; all that attitude of mind which broods over the mistakes of the past and dwells on the shadows which coming events may cast, rather than on the love and will of God–this is Care. Casting all your care upon Him.–The Greek verb indicates not that we must keep doing it, but do it once for all. “How so?” we inquire, fearfully. And too often we have yielded to the suggestion. If we have prayed, it has been in a kind of hopeless way, asking God to help, but not daring to think He would. There has been no assurance, no confidence, no calm within, no tranquility without. Alas for some! They always spend their lives thus. One long, weary monotone of anxiety–struggling against winds and waves, instead of walking over the crests of the billows; treading a difficult, stony pass, instead of being borne along in one of the twenty thousand chariots of God. How infinitely better to cast our care upon the strong, broad shoulders of Christ! Treat cares as you treat sins. Hand them over to Jesus one by one as they occur. Commit them to Him. Roll them upon Him. Make them his. By an act of faith look to Him, saying, “This, Lord, and this, and this, I cannot bear. Thou hast taken my sins; take my cares: I lay them upon Thee, and trust Thee to do for me all, and more than all, I need. I will trust, and not be afraid.” As George Herbert says so quaintly in his sonnet, put care into Christ’s bag. There is no surer path to rest than to pass on to Jesus all the anxieties of life, believing that He takes what we give at the moment of our giving it; that it instantly becomes a matter of honour with Him to do his best for us: and surely it is a sacrilege to take back any gift which we have put into his hands. “Blessed be the Lord, who daily beareth our burden” (Ps 68:19, R.V.). The cup may still have to be drunk, the discipline borne, the work done; but the weary ache of care will have yielded to the anodyne of a child’s trust in One who cannot fail. There is care about our growth in grace.–It is very unreasonable; and yet how common! We fret because we fear that we are not getting on fast enough, and run to and fro in our anxiety to pick up something from other people. As well might a lad in an infant class fret because he may not enter the higher classes of the school. But surely his one business is to acquire the lessons set before him by the teacher. When those are learnt, it will be for the teacher to give him other and harder ones, and to advance him to positions where quicker progress may be made. And it is for us to learn each day the lessons which the Lord Jesus sets us, and to leave to Him the responsibility of leading us forward in the knowledge and love of God. Cast the care of your growth and attainments on the great Leader of souls, and be content to sit at his feet, learning the lessons He assigns. There is care about our Christian work.–How to maintain our congregations? How to hold our own amid the competition of neighbouring workers? How to maintain the efficiency and vigour of our machinery? How to adjust differences between our fellow or subordinate workers? How to find material enough to supply the incessant demand for sermons and addresses? How to shepherd a large flock of souls? What elements of care are hidden in each of these! And in what numberless cases the look of weary anxiety betrays the heartache within! But one is inclined to ask sometimes, Whose work is it? If it is yours, resting on your shoulders only, there may be some reasonableness in the carrying of care. But if, as is surely the case, the work is your Master’s, the burden should be his also. The prime worker is not you, but Christ. He is working through you. You are but his servant. All that you are responsible for is to do what He bids to the uttermost of your power; and He must bear all the cost and responsibility beside. If things are not going smoothly, go and tell Him, and cast all the anxiety of it back on Him, leaving it to Him to extricate or reinforce you. There is care about household and commercial matters.–Servants, with their frequent changes; employers, with unreasonable demands; customers and clerks; creditors and debtors; children, with the ailments of childhood, and the waywardness of youth. To mention any one of these is to touch a bitter spring of care. There are some whose businesses are specially liable to cause anxious, worrying thoughts. Many Christians always think that they must come to beggary; they refuse to enjoy the good things within their reach, because of certain dreaded possibilities. Alas! for that phantom workhouse which bounds the pathway of so many lives, but which is never reached! But each of these sources of worry may become a means of grace, a bond between Jesus and the soul, if placed at his feet, and definitely entrusted to his care. Do not be satisfied with rolling yourself on God, roll your burden also. He who can carry the one can carry the other. When a tiny boy, trying to help his father move his books, fell on the staircase beneath the weight of a heavy volume, his father ran to his aid and caught up in his arms boy and burden both, and carried them in his arms to his room. And will God deal worse with us? He cannot fail or forsake. He can smite rocks, and open seas, and unlock the treasuries of the air, and ransack the stores of the earth. Birds will bring meat, and fish coins, if He bid them. He takes up the isles as a very little thing–how easily, then, your heaviest load: while there is nothing so trivial but that you may make it a matter of prayer and faith. If the father is providing for to-morrow’s needs, why should his little boy leave his play, and lean pensively against the wall, wondering what had better be done? If the pilot has come on board, why should the captain also pace the deck with weary foot? If some wise, strong friend, thoroughly competent, has undertaken to adjust some difficult piece of perplexity for me, and if I have perfect confidence in him, and he assures me that he is well able to accomplish it, why should I fret longer? The thing is as good as done, since he has taken it in hand. 1). Fear is to Satan what FAITH is to God. What are some of the FEARS that Satan will bring into your life? a). Fear of death: “Since then the children share in flesh and blood, He Himself likewise also partook of the same, that through death He might render powerless him who had the power of death, that is, the devil and might deliver those who through fear of death were subject to slavery all their lives.” (see notes Hebrews 2:14; 2:15). b). Fear of failure: so you reason that it is safer not to do anything, because if I do it I will fail. c). Fear of criticism: afraid men will reject us (see Pr 29:25). Along with this is a fear of loneliness of being left alone. d). Fear of exposure of your weaknesses: if I do a work for God, and am out where people can see me, then my weaknesses will be exposed and that would bring criticism, etc. And so the result is that I am immobilized. God has not given us a spirit of fear (2Ti 1:7) (see note) and we need to recognize that God has not given us a spirit of fear, but that it is a tool of Satan. God operates on the basis of FAITH and faith energizes us, faith enables us to do great things for God. THEREFORE He gives us a weapon against fear, the SWORD OF THE SPIRIT, the WORD of God, the only weapon a child of God has. This is how Gideon went into battle — with the sword of the Lord. He surely did not have any classic weaponry and so he was dependent totally on the faithfulness of God and the trustworthiness of His Word to him. That was his weapon against the fear that had previously bound him. Isaiah 26:3 “The steadfast of mind Thou wilt keep in perfect peace, Because he trusts in Thee. (KJV = Thou wilt keep him in perfect peace, whose mind is stayed on thee: because he trusteth in thee.) So when I set my mind on God, I am setting it upon the truth of God’s word. WHAT DOES GOD’S WORD SAY ABOUT FEAR? 1Jn 4:17 By this, love is perfected with us, that we may have confidence in the day of judgment; because as He is, so also are we in this world. 18 There is no fear in love; but perfect love casts out fear, because fear involves punishment (or torment), and the one who fears is not perfected in love. 19 We love, because He first loved us. So first you need to establish in your mind that God loves you with a PERFECT love. It is an unconditional love. See Judges 6:22 Gideon had to deal with his fear of the Lord, but because of what God spoke to him, he came to have PEACE WITH GOD. When I have peace with God that enables me to encounter the world and handle any of the fears that come. It is then that I understand that because He loves me with a PERFECT LOVE, He will not let anything happen to me that is not for my ultimate good and my ultimate Christ-likeness. When that is your mindset you can then handle other fears. Being secure in God’s love becomes the foundation for dealing with all other fears. When we have this mindset, we filter whatever event or circumstance that might be inciting the fear thru the grid of an all powerful, all knowing God Who loves me with a perfect love and Who is sovereign and rules over EVERYTHING. This goes back to the great truth in Is 26:3…keep your MIND steadfastly on Him, keep your MIND stayed on Him…you know that He loves you with a perfect love and that CASTS OUT FEAR. FEAR never comes from God (2Ti 1:7) For God has not given us a spirit of timidity, but of power and love and discipline. Satan is the father of lies and when this thought comes it is not from God but from the enemy. Acknowledge the truth in this Scripture when faced with fear. POWER comes from God: God has given us power. Lk 10:19 “Behold, I have given you authority to tread upon serpents and scorpions, and over all the power of the enemy, and nothing shall injure you. God has given us authority over all the power of the enemy. We have the power to refuse to accept the thoughts of the enemy. God has given us a SOUND MIND: a mind under control. We fear man’s criticism, rejection, being left alone. What is the “snare” or the result of being ensnared by the “fear of man”? We become men pleasers and we try to do whatever it takes to make men like me. We cannot be a bondservant of God and a slave of man. If you want to walk without the fear of man, then you must walk as a “God-pleaser”. You must live with the abandon that whatever pleases your Father, you are willing to do NO MATTER WHAT MAN THINKS OF ME! And you can be secure in this truth (Pr 29:25b) for God will never forsake you (Heb 13:5) but man will. You cannot have FAITH and FEAR at the same time. Fear puts your eyes on the circumstances or situations and takes them off the “I Am” (“I Am” anything and everything you will ever need). When you take your eyes off God, you are forgetting His sovereignty, His omniscience, His omnipotence, etc, all His qualities that we remain steadfast in mind in regard to (Isa26:3). Is 51:12 “I, even I, am He who comforts you. Who are you that you are afraid of man who dies, And of the son of man who is made like grass;13 That you have forgotten the LORD your Maker, Who stretched out the heavens, And laid the foundations of the earth; That you FEAR CONTINUALLY ALL DAY LONG because of the fury of the oppressor, As he makes ready to destroy? But where is the fury of the oppressor? So God says when we begin to FEAR MAN, we FORGET “I Am” our Maker, the omnipotent Creator of all. God is saying He is SOVEREIGN and in control of all these events. Take your eyes off men – they are going to die — don’t fear them. I am in control He is saying and so as we keep our minds stayed (Is 26:3 KJV) on Him, He keeps our minds in perfect peace (Shalom, Shalom > peace, peace > well-being, well-being) (cp Php 4:7 – note). You might say “But what if I get killed?” Where will you be then? Present with the Lord!!! We do not need to fear death. Once we see Him we will never wonder why we died when we did. We will be exalting Him and worshiping Jesus our Redeemer. We will not want to go back into this world! And remember no one can kill you w/o God’s permission. You are INVINCIBLE and INDESTRUCTIBLE until God says “Come on home”. And no matter what you are called to go thru, God promises that He will never give you more than you can endure. We are not to be afraid in CONFLICT. When we are not afraid in CONFLICT, it shows that we have confidence in God. In what attribute or truth of God? That God will keep you in perfect peace if you keep your mind stayed on Him (Is 26:3). WHAT IS THE CURE FOR FEAR? Ps 27:1 (of David.) The LORD is my light and my salvation; Whom shall I fear? The LORD is the defense of my life; Whom shall I dread? WHERE DOES HE GET HIS CONFIDENCE? Psalm 27:4 One thing I have asked from the LORD, that I shall seek: That I may dwell in the house of the LORD all the days of my life, To behold the beauty of the LORD, And to meditate in His temple. 6 And now my head will be lifted up above my enemies around me; And I will offer in His tent sacrifices with shouts of joy; I will sing, yes, I will sing praises to the LORD. Pr 3:13-26, 22: Teach that “Wisdom” is the CURE for FEAR. 22 So they will be life to your soul, And adornment to your neck. 23 Then you will walk in your way securely, And your foot will not stumble. Psalm 56:3 When I am afraid, I will put my trust in Thee. 4 In God, whose word I praise, In God I have put my trust; I shall not be afraid. What can mere man do to me? This entry was posted in Bible Teachings, Inspirational Messages and tagged anxiety, casting all your care, Christianity, doubt, Faith, fear, fear not, freedom from fear, God, God and worry, God cares, handling stress, I Peter 5:7, I Peter 5:7 Casting all your cares, stress, unbelief, worry. Bookmark the permalink.